Food safety testing refers to the inspection of food products for disease-causing organisms, chemicals, and other hazardous materials. It is generally targeted at three primary food contaminants namely, pathogens, chemicals, and genetically modified organisms (GMOs). Food fraud is committed when food is deliberately altered for financial gains with the intention of deceiving consumers. The food standards agency (FSA) specifies two main types of food frauds namely, sale of food that is unfit and potentially harmful and deliberate misdescription of food. 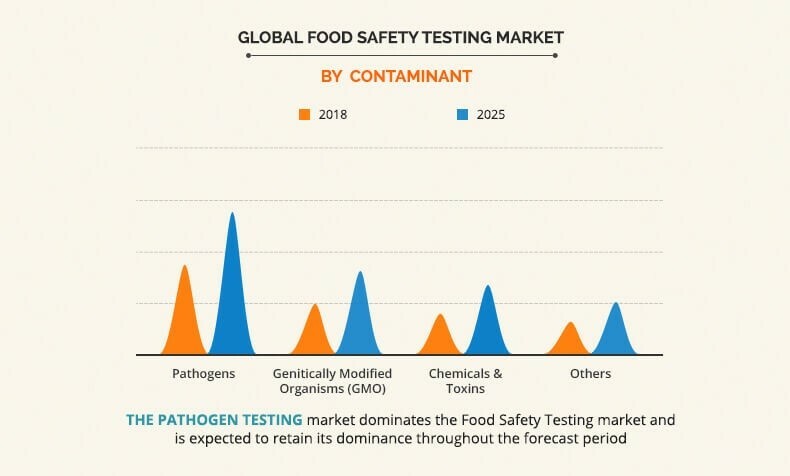 Implementation of various regulations on food safety, particularly in the developed economies, drives the growth of the global food safety testing market. Recycling of animal by-products, sale of goods past their use by date, inclusion of harmful ingredients, and unsafe food handling processes are some of the major food fraud activities. The consumption of contaminated food, including toxic chemicals and radioactive materials, results in foodborne illness, which may even lead to death. The implementation of stringent regulations by many leading food safety organizations, such as Food Standards Agency, European Food Safety Authority, Food Safety and Standards Authority of India, and Canadian Food Inspection Agency, to prevent ill health of consumers and food fraud is expected to drive the growth of the global food safety testing market. In addition, rise in economically motivated adulterations (EMAs) due to high competition among food producers, and increase in instances of food debasement, such as adulterations, pesticides, artificial taste enhancers, and certifications, boost the growth of the food safety testing market. However, lack of food control infrastructure in the developing economies, complexity in testing techniques, and lack of harmonization of regulations are anticipated to hamper the growth of the market. The global food supply is under constant threat of contaminations, and this generates a demand for effective test products that can ensure food safety. Microbial pathogens, such as bacteria, viruses, environmental toxins, food allergens and adulterants, residues of drugs, and agricultural chemicals, are hazardous to human beings, if consumed unchecked. Pathogen testing is still the most dominant segment of food testing. Increase in application of pesticides in agriculture and high application preservatives have been generating demand for the chemical & toxin testing market, followed by the genetically modified organism (GMO) market. The global food safety testing market by food tested is categorized into meat & meat product, dairy & dairy product, cereal, grain, & pulse, processed food, and other ingredients. The meat & meat product and processed food are the most dominant segments in this market. Meat & meat products and processed food products are often processed with various types of artificial ingredients to increase the shelf life as they are highly prone to bacterial growth. This generates high demand for food testing to detect harmful chemicals & toxins and pathogens. Increasing demand among consumers for fresh and appropriate forms of food products has led to the advent of food safety practices in the food industry. However, high occurrence of foodborne disease outbreaks in several countries, including developed nations such as the U.S., has resulted in increasing concern and intensive investigation of foodborne pathogens. Thus, there is currently an increased demand for microbiological testing of food products. The purpose of a microbiological testing is to identify and restrict growth of harmful microorganisms, which may lead to spoilage of foods, and thus, ensure safety from foodborne diseases. In this report, the global market by technology has been segmented into agar culturing, PCR-based assay, immunoassay-based, and others. Agar culturing is one of the traditional processes to test pathogens. However, currently, PCR-based assay and immunoassay-based methods are more accepted than traditional methods, as ongoing developments have discovered that traditional methods are not suitable for all food products. By region, the global food safety testing market has been analyzed across North America, Europe, Asia-Pacific, and LAMEA. North America is the leading market contributing more than two-fifths of the global food safety testing industry. However, emerging markets, such as China and India, are one of the most potential markets for the food testing industry, followed by the LAMEA region. Some of the major players analyzed in this report are SGS SA, Eurofins Scientific, Intertek Group plc, Bureau Veritas SA, ALS limited, TUV SUD, AsureQuality Ltd., DNV GL, Bio-Rad Laboratories, and Laboratory Corporation of America Holdings. Food fraud has been a major concern for the food industry since decades; for instance, the adulteration of imported tea with iron filings in the nineteenth century. At present, meat adulteration, substitution of alternative species of fish, use of chemicals such as formalin in meat & fish products, and others are expected to be dominant in the market. As detection of food fraud is difficult, it is necessary to develop advanced analytical techniques, such as molecular biology, isotopic analysis, and a range of classic physical, chemical, and biological methods, to test for food safety and detect the noncompliance in food products. Economically motivated adulteration (EMA) has rapidly increased in the market, which is a major health threat for consumers. Meat and processed food product segments are expected to witness the highest growth rate during the forecast period. The Asia-Pacific region is expected to witness significant growth on account of increase in processed food production and rise in food safety concerns among consumers. Furthermore, supportive government policies in countries, such as China and India, coupled with foreign investments in the food & beverage industry are anticipated to boost the food safety testing market during the forecast period.